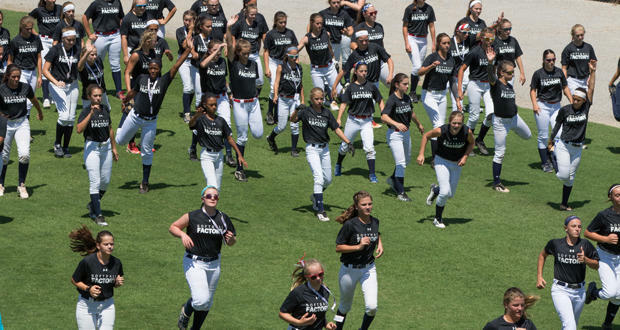 Participants of the USA Softball All-American Games tournament perform warm-up exercises on the field at USA Softball Hall of Fame Stadium in Oklahoma City. The stadium is also home to the NCAA Women’s College World Series. The NCAA turned down Oklahoma City as a host for eleven tournaments that will occur between 2019 and 2022. Among the events that Oklahoma City tried to attract were the Division I and Division II wrestling championships. Tim L. Brassfield, the executive director of the Oklahoma City All Sports Association, said the city lost out on the wrestling tournament because the Chesapeake Arena was too small, among other factors. He said the wrestling championships instead went to four cities where they had never been held previously, including U.S. Bank Stadium in Minneapolis, home to the Minnesota Vikings. Another year, the championship will be in Pittsburgh, down the road from Pennsylvania State University. Fleming says the NCAA has changed how they bid out championships. “Normally they would do a few every year, but this year all the Division I to Division III championships were bid out and that was for until 2022. So this was a huge loss because these events won't be bid out again anytime soon,” Fleming told KGOU. Oklahoma City was not selected for the first and second rounds of Division I men’s basketball tournament. Some states, like Texas and Missouri, offer tax incentives to lure sporting events. Fleming says it would be difficult for Oklahoma to offer incentives because state leaders are more interested in eliminating incentives at this time. Additionally, she says sports tournament incentives would primarily help Oklahoma City and Tulsa, and not rural areas. “It would be hard for smaller cities, though, to get these events because they might not meet the needed hotel room count,” Fleming said. In addition to missing Division I men’s basketball and wrestling, Oklahoma failed to attract men's and women's gymnastics championships, the Division III tennis championship, the Division I volleyball tournament, Division I bowling tournament, and the Division II and Division III softball championships because the USA Softball Complex will likely be undergoing renovations at the time. However, the city will still host several previously arranged tournaments, including the NCAA Women's College World Series, the Big 12 baseball championship, the Big 12 softball championship and the Big 12 women's basketball championship. Fleming says the big question now is what Oklahoma City can do to attract future tournaments. “The City Sports Consortium is having a study done by New York University's Sports Management Program. That program works with the U.S. Council of Mayors, which we know our mayor is the president of, and so he's working with them on trying to see what other cities do and what Oklahoma City can do to keep playing in the game,” Fleming said. Jacob McCleland: This is the Business Intelligence Report, a weekly conversation about business news in Oklahoma. I'm Jacob McCleland. Thank you for tuning in. I'm talking today with Molly Fleming. She's a reporter at The Journal Record newspaper. Molly, thanks for joining us. McCleland: Now Molly, I want to talk about a story you wrote in The Journal Record this week. The Oklahoma City All Sports Association was turned down as a host for 11 NCAA events for 2019 to 2022. Why didn't it work out for Oklahoma City here? Fleming: There were a variety of reasons for the Division I Wrestling Championship. The NCAA said our venue, Chesapeake Arena, was too small. One year the event will be at the U.S. Bank Stadium in Minneapolis, home of the Minnesota Vikings. It's a little hard to compete with that. Another reason the NCAA decided was because Texas and Missouri were giving incentives which is something that we don't do. We also lost Division I bowling because we don't have a host school. There are no universities with a bowling team, interestingly. And we missed the Division II and Division III softball championships because the USA Softball Complex will likely be undergoing renovations at the time. McCleland: So we were turned down for 11 different events. Is that a lot? Fleming: From what I've heard. Yeah. That is a lot. And the big deal is that the NCAA changed how it bids out the championships. Normally they would do a few every year but this year all the Division 1 to Division 3 championships were bid out and that was for until 2022. So this was a huge loss because these events won't be bid out again anytime soon. McCleland: Now, we should be clear that there will still be several NCAA events in Oklahoma City in the coming years. We'll host the NCAA Women's College World Series, the Big 12 baseball championship, the Big 12 softball championship and the Big 12 women's basketball championship. But which events did the Oklahoma City All Sports Association try to attract but it couldn't land? You mentioned wrestling and bowling, I believe. Fleming: Yes. And we also missed the men's and women's gymnastics championships, the Division III tennis championship, and the Division 1 volleyball. We missed Division I first and second round men's basketball, which will go to Tulsa because the northeastern metro offered significant incentives is what we were told. McCleland: So can the state offer incentives to improve Oklahoma City's chances of getting one of these big athletic competition? You mentioned that Tulsa and Missouri and Texas have done that. Fleming: Well sure they can. Other states do. But you know as we've seen our state leaders are really weary of incentives. They often try to get rid of the incentives. There was the big study last year that looked at which ones are profitable. I mean even the State Historic Preservation tax credit is looked at and often even discussed getting, you know, being abolished. So it would be hard for smaller cities, though, to get these events because they might not meet the needed hotel room count which then puts you with them metro versus rural. I don't see the state getting into this because there's just too much division. Fleming: What can Oklahoma City do then too to improve their chances of landing these NCAA events? McCleland: That's the big question right now. There is talk of you know if the city could do some type of incentive but it have to come for the state and if the you know the state would pass that money down to the cities. The city, the City Sports Consortium is having a study done by New York University's Sports Management Program. That program works with the U.S. Council of Mayors, which we know our mayor is the president of, and so he's working with them on trying to see what other cities do and what Oklahoma City can do to you know keep the keep playing in the game. McCleland: Now Molly there's obviously a strong business angle to this sports story. I mean how much revenue can a large NCAA sporting championship bring to Oklahoma City? Fleming: That's hard to calculate. And I honestly don't have that number. But the NCAA wrestling championship would have brought 90,000 people to Oklahoma City. So that's a lot of hotel rooms, restaurant revenue, you know sales taxes which are whole city's operations is based on. And with the wrestling championship, especially D1 the D1 and division 2, Stillwater would have probably seen a kick from that as well because they have the Hall of Fame. And so people you know they had a break in their day could have taken the quick drive to Stillwater, visited the Hall of Fame, you know, shop downtown Stillwater, and then come back to Oklahoma City or even stay in Stillwater. So it really was you know kind of a regional loss to miss those championship until 2022. McCleland: Molly Fleming is a reporter for The Journal Record newspaper. Wally thank you so much for your time. McCleland: KGOU and the Journal Record collaborate each week on the Business Intelligence Report. You can find this conversation archived at KGOU.org. And you can follow us on social media. We're on Facebook and Twitter @journalrecord and @kgounews.